In this Challenge, you will turn Might and Magic VI into a puzzle-platform game with unique physics (kind of like Valve's Portal) without installing any patch or mod. Before the Challenge, use Fly or Jump magic to get yourself onto the rooftop of the Well of Luck (white number 0). 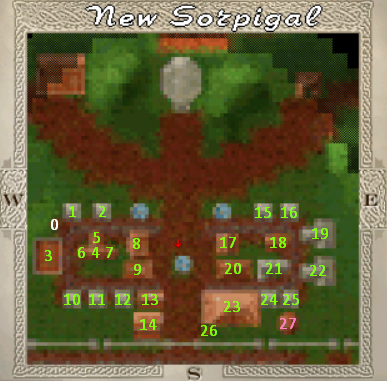 To complete the Challenge, you need to step on the rooftop of every building/well (excluding the Dragon Tower) in the central area of New Sorpigal, without falling to the ground. Original features of the game, including game save, load and turn speed setting, are allowed. If you use GrayFace patch, the MouseLook feature can greatly lower the difficulty of the Challenge. But this is not a must-have to complete the Challenge, it's possible to succeed the Challenge without this feature (very very hard, though). The Challenge is not easy, but super interesting. Good luck to everyone. p.s. You jump higher with jump key in GrayFace version than in non GrayFace version (official 1.0-1.2, or Mok's 1.3 patch), which makes you able to get onto the rooftops from the ground completely without Fly or Jump magic. You could try. There are actually two ways. Last edited by tomchen1989 on May 6 2017, 23:40, edited 2 times in total. tomchen1989 wrote: p.s. You jump higher with jump key in GrayFace version than in non GrayFace version (official 1.0-1.2, or Mok's 1.3 patch), which makes you able to get onto the rooftops from the ground completely without Fly or Jump magic. You could try. There are actually two ways. But if you jump from the ground without a spell, you get stuck on the roof level and can't get onto the house. I tried a lot before I found out Jump/Fly would take me to a much higher level above the well roof and from there I can easily get to the nearest house. My patch effects every motion of the party, so the whole challenge would be harder without it. Last edited by GrayFace on May 7 2017, 18:34, edited 2 times in total. In that paragraph, I mean, player can get onto one of these rooftops by using Jump key, and actually, I found two ways, none of which has anything to do with that well. That well, is exactly like what you described: Jump key makes player stuck between the well wall and its roof in the version with your patch (however, although under the rooftop, player can still jump using the rooftop's tilt). And in original version, player cannot even jump onto the well wall at all. Oh I didn't know your patch affects jumps using the rooftop's tilt. I tried, the team seems to jump at same distance without and with your patch (Maybe I'll try again). And I thought the difficulty is far higher in original version, but only because of the fact that the game has no MouseLook feature so the turn is not very controllable. Last edited by tomchen1989 on May 8 2017, 19:35, edited 2 times in total. This is silly. But I love it! When I first read this post, I thought the OP made a typo with saying that the jump key wasn't allowed. I never knew I could go from rooftop to rooftop without jumping. I completed the challenge and then shared it with my Dad who completed it as well. We both enjoyed it. 1) Position yourself near the top of any upward slope, making sure you're on the slope. 5) While your game is on the loading screen, (with the human casting a fireball at the demon) press and hold down the 'forward' key. 5) While still holding down the 'forward' key, watch your party leap majestically into the air! Last edited by Anubis on May 10 2017, 18:17, edited 1 time in total. If you want to experience vanilla jumps, add "FixMovement=0" to mm6.ini. 1) Get to any roof using Jump key. 2) Get to the roof of the Stables. In order to do so, you'll need to use the trick Anubis has discovered. 3) Continue the challenge as usual, but starting from Stables - you won't need save-load trick anymore. I will leave it to you to discover the way to do first 2 items on the list. Starting from Stables is also harder than starting from the well. Last edited by GrayFace on May 11 2017, 14:54, edited 5 times in total. Anubis wrote: When I first read this post, I thought the OP made a typo with saying that the jump key wasn't allowed. I never knew I could go from rooftop to rooftop without jumping. I completed the challenge and then shared it with my Dad who completed it as well. We both enjoyed it. This trick (or bug), WOW, that's really good. The party jumps far higher than usual. I didn't know it and actually I didn't mean to permit such powerful trick when I said "game save and load are allowed". Sorry I don't quite get it. Do you mean get to any roof/the stable's roof, from another roof as a starting point, or completely from the ground? And when jump key is allowed, save-load jump trick should not be allowed, and vice versa, right? And I don't think starting from the stable is too much harder than starting from the Well 0. Below is my conclusion which I think pretty clear, please comment on this. It is possible to complete the main Challenge even without stepping on the Gate of the Town! In original version, or Grayface version without movement fixed, for now I really think the jump key is useless, I don't know where player can make it useful. Last edited by tomchen1989 on May 11 2017, 19:53, edited 2 times in total. GrayFace wrote: 1) Get to any roof using Jump key. Sorry I don't quite get it. Do you mean get to any roof/the stable's roof, from another roof as a starting point, or completely from the ground? tomchen1989 wrote: And when jump key is allowed, save-load jump trick should not be allowed, and vice versa, right? Yes. For 1) jump key is needed, for 2) save-load trick is needed once. Wow! I was pretty sure it's impossible to get from 15 - 26 to 0 - 14. Hence, the need for save-load trick in 2). Did it Now save-load trick can be removed from 2). tomchen1989 wrote: In original version, or Grayface version without movement fixed, for now I really think the jump key is useless, I don't know where player can make it useful. Yes, I've reduced jump speed. In version 2.0 the party was able to jump over a fence on the start of Dragoons Caves for example, which shouldn't be possible. Last edited by GrayFace on May 12 2017, 3:22, edited 3 times in total. You can get to the roofs from the balcony of building 23. P.S. I also tried other maps. Some allow parkour around the whole area without save/load trick, only with normal jump to get to the 1st roof, but none seem to have such a challenge as New Sorpigal. If only I could get to the roof the the temple in White Cap (north-eastern part), that'd been a good challenge (well, get on top of it that is. I could get 'into' it, standing on the bottom border of it). Last edited by GrayFace on May 18 2017, 14:59, edited 1 time in total. I tried using the save/load trick to get on top of Temper's castle (where you can train in Plate) in Free Haven, but no go. I wonder if MM7/MM8 has the same mechanics. I also had no luck trying to get to the top of Castle Kriegspire where the Bow master is. Had to use the Fly scroll you find in the beginning in New Sorpigal. Temper's castle at least can be accessed with NPC from Dragonsand that casts fly. In MM7/MM8 gravity is heavier and these jumps don't work well enough, although I don't think I tried save-load trick. There could be some prospects for jumping in Ravenshore for example. I used the Jump key 3 times where it was unnecessary, because I forgot that it shouldn't be used. Last edited by GrayFace on Dec 17 2018, 0:16, edited 1 time in total.